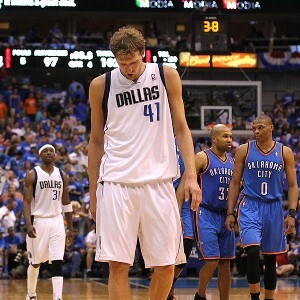 The NBA defending champions, the Dallas Mavericks, have been eliminated from the first round of the 2012 playoffs after being swept by Oklahoma City Thunder in four games. The number two ranked Oklahoma City Thunder, one of the best teams in the league throughout the season, were the clear favorites against the number seven ranked Dallas Mavericks when the series started. The veteran Mavs started the best of seven series by playing the first two games on the road. The Mavs lost these two games by a total of four points. They lost the first game on a heartbreaking game-winning shot at the buzzer by Kevin Durant, NBA’s leading scorer. Similar to the first game, the Mavs led in the final minutes of the second game, but once again could not close it out with a win. While the two games in Oklahoma City could have gone either way, game three of the series was a different story. Back in their home turf, the Mavs were expected to bounce back and win the two games at home. Unfortunately, game was not a close game. The Thunder led throughout the game and it was a rout from start to finish. The Mavs put on a valiant effort in game four, but behind the great game of James Harden, 2012 sixth man of the year, the Thunder won the game and clinched the series, effectively sweeping the Mavs. Just a little less than a year ago, the Dallas Mavericks hoisted the first championship trophy in the club’s history. So what happened? How did the Mavericks become just the second team in NBA history to be swept out of the playoffs the year after they win the championship? The roster changes that took place during the off season played a major role. The Mavericks lost important role players that helped them during the championship run. Defensive and emotional anchor, center Tyson Chandler, was traded to the New York Knicks. Back-up point guard Jose Barea, who played a major role in numerous games, was traded to the Minnesota Timberwolves. The Mavericks traded these two players and a few others to open up cap space and prepare for 2012 free agency, showing that their main priority for the season was acquiring top free agents and build for the future rather than defend their championship. Will this pay off? We will have to wait and see in the 2012 off season.